According to IEEE802.3,IEEE802.3u,10/100Bast-TX,100Base-FX standard. Support IEEE802.3X flow control function. 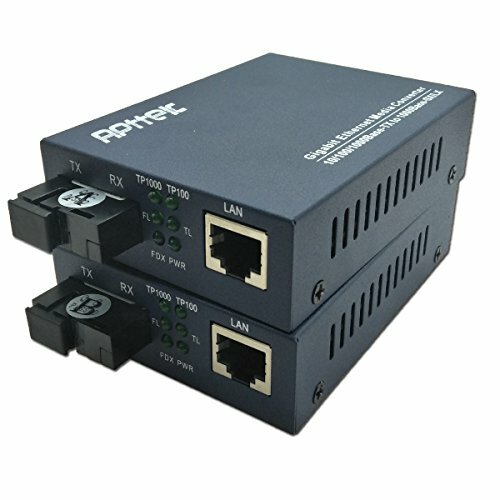 Ethernet port support 10/100M,full-duplex and semiduplex auto-negotiation. Ethernet port Auto-MDI/MDIX auto flip,parallel/across twisted-pair auto-negotiation. Support storage transmission and direct transmission. Ultra-low time-delay data transmission, completely transparent to the network protocol. Built-in 288KB RAM data buffer,suport 2046Bytes long data packet. 50/125um or 62.5/125um multimode fiber link transmission distance up to 550meter and2KM. 9/125um singlemode fiber link transmission distance up to120KM. Modulization configuration design,chassis support power supply for cassette media converter. Support hot-swappable,plug and play. LED indicators,dynamix feedback link connection state and fault detection. 5.Built-in lightning protection circuit, significantly reduce the damage caused by thunderbolt induction. Average working time more than 100,000hours without failures. If you have any questions about this product by APTTEK, contact us by completing and submitting the form below. If you are looking for a specif part number, please include it with your message.